Park Shin Hye International Fanclub | 박신혜 국제 팬클럽: [NEWS] Park Shinhye and Yoon Shi Yoon dating in Hong Kong? 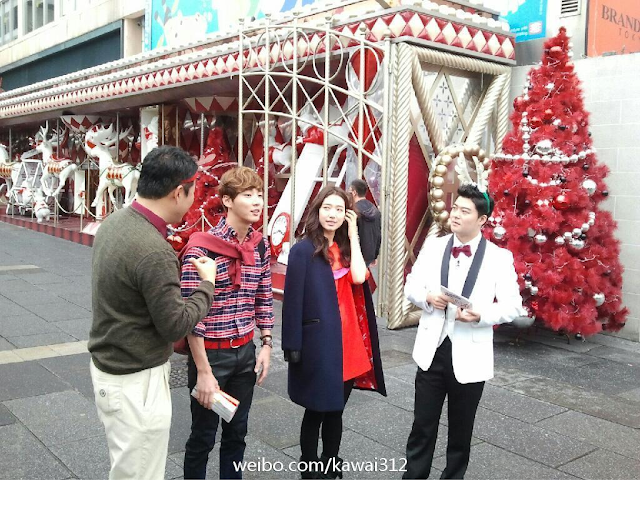 [NEWS] Park Shinhye and Yoon Shi Yoon dating in Hong Kong? Actors Park Shinhye and Yoon Shi Yoon were caught dating in Hong Kong. Instead of drama filming, Cable TV network tvN's drama 'Flower Boy Next Door''s protagonists Park Shinhye and Yoon ShiYoon were seen dating in the busy streets of Hong Kong. The duo were invited to participate in '2012 MNet Asian Music Awards' in Hong Kong on November 30. But why were they touring the landmarks together instead of awards rehearsals and drama filming? Turns out they were not dating, but working. Park Shinhye and Yoon Shi Yoon are going to be featured in tvN's talk show 'Taxi' (현장토크쇼 택시) and they have chosen Hong Kong as their filmin location. The pair went around Hong Kong, stopped at landmarks in Central and Tsim Sha Tsui districts to film and wowed at the Christmas lights. According to the crew, Park Shinhye and Yoon Shi Yoon became more friendly towards each other during the filming, and theatmosphere was good and sociable. After that, they headed for the MAMA red carpet and awards show. tvN's 'FLower Boy Next Door' is set to broascast starting January 7 2013. Thanks for the teaser and info! Can't wait for the drama broadcast and taxi program ep! Plz don't forget to post the taxi ep when it's released!!! Yes agreed with all the above Comments but still prefer JYH. She looks so beautiful especially in the Red Gown and among all the Actresses whom participate in the MAMA, PSH looks the best. PSH has looked good with everyone she has acted with. I liked her with all but JYH was the favorite. I hope YSY would be all that I have heard about him as an actor. In future would love to see her with LSG too. Waiting for the taxi program too. PSH has really become a tourist in Hong Kong. First in Olive City and now in Taxi. I so agree with you whole heartly! So many times the ones that you think are you friends are just users that are looking to get what they can. I hope nothing but the best for you in the years to come. I love this couple....they look amazing together. I hope they will be a couple in real life. I enjoy their dorama.